This is an expert-grade app for those who are comfortable with G', G'' and WLF, and who are seeking to understand how to balance all the formulation factors for a PSA. Luth's1 insights tell us that there are three independent parameters that can be altered rationally, rather than what the formulator typically sees which is that changing one thing changes everything else. This discussion of the ideal PSA is the work of Roelof Luth at Arizona Chemical in the Netherlands. It is a prime example of "systems" thinking and the springs and dashpots in the graphic appear below as real science. Luth's approach builds on the work of another Dutch scientist, Jan Burgers. Luth is well-known in the industry as an expert rheologist and this approach to the ideal PSA has been developed over recent years. Although Luth enjoys the theoretical aspects of the ideal PSA, the drive behind the development of the theory is very much practical and has been the basis for many successful PSA formulations in recent years at Arizona Chemical. In reality, all PSA show some pure elasticity and some pure viscosity under extreme conditions (high speed for the first, slow speed in a shear test for the second) but most of the time they show a more useful set of behaviours. These are characterised by a parallel set of elastic (G2) and plastic (viscous) (η2) parameters which in some cases match G' and G''. Such a combination of viscous and elastic behaviour is described by the Burgers visco-elastic model. G1 and G2 are shown as pure elastic springs and η2 and η3 are shown as pure "dashpots" - dampers that resist motion via viscous friction. How do we know that the Burgers model is the right one to use for a PSA? Apart from the intuitive interpretation of the 4 components discussed above, the graph of its frequency response, shown below, exactly matches what most of us would like to have in a real PSA. Importantly, the model allows a host of other parameters, sometimes claimed to be important, to be estimated directly from just the 4 parameters: G''max, G'plateau, Tanδmax, TCross1 etc. In the app just 3 of these parameters are shown, others can be read directly from the graph. It turns out that you can formulate using just the 3 chosen parameters by rationally varying the 3 components of a PSA. Because of WLF we can plot the graph in terms of 1/ω, i.e. from low to high frequency (short to long timescale) or in terms of temperature. For convenience of labelling the axes the frequency range and the temperature range are rather idealised in the plot below. If we could tune our PSAs as easily as we can tune the Burgers model, formulation life would be straightforward. Or to put it another way, by comparing the G' and G'' behaviour of your actual PSA against this ideal PSA you can work out where things are going wrong in your formulation. Once you've played with the app, the text below shows how to use it in your own formulation development. Polymer. This gives the basic strength of the system and in particular it needs to have a high tensile strength σ which is at the heart of high peel. Unfortunately all such polymers have far too high a modulus and therefore (Dahlquist) show no peel. Oil. This is a completely useless diluent. It has only negative properties. But because (as we discuss below) we have 3 key properties to get right, we need 3 independent variables to be able to reach the sweet spot of our formulation. As an example, the right amount of tackifier to raise the Tg to the right level might not be enough to reduce G' to the Dahlquist criterion, so some oil has to be added. This, of course, also reduces Tg so there has to be some further increase in tackifier. G'p. This is G' of the Plateau region. 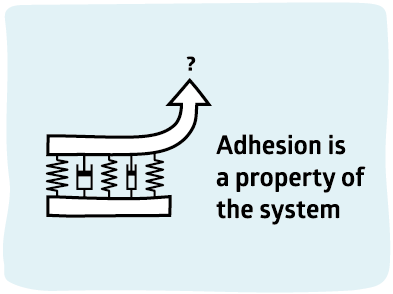 This controls the cohesion/adhesion balance and must be below the Dahlquist criterion (0.3MPa) to get instant adhesion onto a surface. The base polymer has far too high a value of G'p and by the rule of mixing, it can be reduced by dilution with the tackifier and/or oil, both of which have an insignificant G' at the ~1s timescale. Too much tackifier/oil gives a weak (low tensile stress σ) system with little cohesive strength. Tδmax. The temperature of the maximum value of Tanδ defines the Tg of your system. If it's too low then at room temperature you are too mobile/liquid if it's too high then at room temperature there is not enough tack. Clearly adding tackifier (high Tg) increases Tδmax and adding oil decreases it. TCross. The temperature at which G' and G'' cross for the last time (to the right of the curves) defines your shear resistance. It might seem that TCross should be as high as possible. Unfortunately that also tends to make the system too viscous to process easily. The main influence on TCross (for a given polymer) is the tackifier type - you increase TCross with a tackifier that "interacts more strongly" with the polymer. That is deliberately worded in a vague manner as it is so system specific. The main formulation problem is that every change you make to one part of the system (e.g. changing the tackifier/oil ratio) seems to affect every other part. The trick behind smart PSA formulation is to be able to separate the 3 variables. For example, you will want to reduce G'p of the original polymer with a tackifier/oil mix. And you will want to vary Tδmax by changing the tackifier - a higher Tg tackifier increases the value. With a modest investment in DOE you can readily work out the formulae for each effect for each single component (e.g. different tackifiers). You can then invoke the fact that for a Burgers model the effects follow an ideal mixing rule - if you need a value that's 40% between Tackifier1 and Tackifier2 then you use 40% of 1 and 60% of 2. There is an important qualifier to this ideal mixing rule. It is only obeyed if the components mix ideally. If a tackifier phase separates from the polymer then all bets are off. If an oil phase separates then it oozes to the surface and destroys any adhesion properties. It's therefore vital to know the Hansen Solubility Parameters of the polymers, tackifiers and oils in your formulation set so you only combine those with low HSP Distance and therefore high compatibility. At first it seems too good to be true. You take an ideal formula, you work out your ideal set of the three parameters and then you use an ideal mixing rule to formulate by numbers obtained (for example) via DOE. Surely life isn't that simple! Of course it's not. There are subtle effects to complicate the picture and there is no direct link between the properties of this ideal system and the peel strength (probably because σ doesn't immediately follow from rheological data). But using this ideal approach you can get to the right zone in a fraction of the time and can then use a final DOE, focussed in this narrow zone, to get the final formulation. Via DMA (rather than a rheometer, though the distinction is largely terminological) the G' and G'' curves over a large frequency range (10-4 to 106) should be measured. You need a really good machine to get reliable measurements over such a large range. A less good machine will give you artefacts at the extremes. Note: I always assumed that the plateau region was all the same till TCross. But the change in G'' 2/3 along the region alerts us that things are starting to fall apart. On the surface (G') nothing has changed but the polymeric network is beginning to show signs (increasing G'') of becoming less coherent. I am grateful to Roelof Luth for his patience in explaining all these basic ideas to someone like me who doesn't "get" such ideas first time round. The app originated in a discussion over a beer in a sunny square near Amsterdam. Luth is an expert rheologist and I am not. It took a lot of patience from Luth (and some expert algebra) before I could write a functioning app. The app has been astonishingly useful and I record my formal thanks for his ideas and assistance.